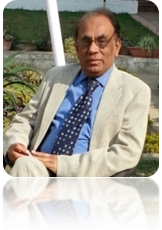 Mumtaz A. Quraishi, Indian Institute of Technology (Banaras Hindu University) Varanasi, Indian, Full Professor, Doctor of Sciences, Fellow Royal Society of Chemistry UK. Mumtaz Ahmad Quraishi defended his Ph.D. thesis in 1986 and his doctoral thesis in 2004. He has published over 300 scientific works. He is an Editorial Board member of the journals “International Journal of Advanced Chemical Science and Applications”, “Research Journal of Chemical Sciences”, “Journal of Steel Structure & Construction”, “Journal of Lean Corrosion”, “International Journal of Corrosion”, “Advances in Nano-materials and Corrosion”, “The Open Electrochemistry Journal”, “Journal of Materials and Environment Science”, “Innovations in Corrosion and Materials Science”, “International Journal of Nano Corrosion Science and Engineering”, “American Chemical Science Journal”, “Indian Journal of Materials Science”, “Recent Patents on Materials Science” and “International Journal of Research in Engineering and Technology”. M.A. Quraishi has been given a number of awards from the International Science Congress Association (ISCA), Indian Section of NACE International USA, and other institutions, including awards for best publications and achievements. In various periods he was the Regional Director of NACE India and a member of scientific committees. M.A. Quraishi is an expert in Corrosion and Scale inhibition, Green chemistry, and Synthetic organic chemistry.